With the advent of internet streaming and increased abundance of both movie and TV content available from a variety of services, Cable/Satellite cord-cutting has gotten a lot of attention the past couple of years. However, one of the problems with cord-cutting is being able to access local and network TV programming without subscribing to cable or satellite. One option is to dump cable/satellite and go back to the "old fashion way" of accessing TV shows, via an antenna. All TVs that have built-in tuners that can receive over-the-air signals, but one feature that they lack that cable/satellite offers is DVR functionality. However, that is not a problem anymore as Channel Master has introduced a DVR that is designed specifically for those receive their TV programs over the air - The DVR+ TV Antenna DVR. To find out if the DVR+ is the right solution for your cord-cutting needs, keep on reading. Official Model Number Reviewed: CM-7500GB16. Dual Tuner DTV/HDTV receiver combined with DVR functionality. 16 GB built-in flash memory storage that provides up to 2 hours of HD recording (can also pause live TV). Expandable storage via optional compatible external hard drives. There is no brand or size restriction indicated - However, Channel Master does offer both a 1TB and 3TB option. Can record incoming signal resolutions up to 1080p. No monthly DVR subscription fees. Internet access via wired Ethernet/LAN connection or optional USB WiFi Adapter to a network router. Access to downloadable firmware updates via internet or USB flash drive. Video output resolution options include 480i, 480p, 720p, 1080i, and 1080p. Video input signals are up or downscaled depending on the how the output resolution is set. Also, video and audio signals are output via HDMI connection, the DVR+ does not provide analog video outputs, but does provide audio output via HDMI or 3.5mm Toslink connection. Audio format support includes Dolby Digital, Dolby Digital Plus, and PCM. The DVR+ can record one channel while you are watching another channel at the same time, or can record two channels at once (with an external hard drive attached). Recording function can activate even if DVR+ is in standby mode. Internet streaming access is also included via provided Ethernet. Some of the available services include Vudu, YouTube, Pandora, and Sling Television (offers 30+ additional streaming channels). Vudu requires pay-per-view fee for most content, while Sling TV requires a monthly subscription fee). Also of note is that Netflix is not offered. NOTE: Only over-the-air Channels can be recorded - streaming content be viewed, but not recorded. Electronic Program Guide (EPG) powered by Rovi (now a part of TIVO). Wireless Programmable Remote Control Provided. Compatible with Slingbox 500 for streaming DVR+ content to other devices not physically connected to the DVR+. Viewing of live over-the-air TV channels. Recording of TV programs (two at once, or watch one/record another at the same time) as well as the ability to pause live TV. Access to selected streaming content channels. Setting up the DVR+ is easy. First, it is a very thin and flat, as shown in the above photo, which makes it easy to place in just about any space near your TV. After you place it where you want, then just connect any indoor or outdoor TV antennas RF coaxial cable (either push-on or screw-on) to the unit's RF/Antenna input, connect the HDMI output of the DVR+ to your TV (or home theater receiver), then connect either an Ethernet Cable or optional USB WiFi adapter, and then plug in the detachable power supply. Although any TV antenna can be used, it is important to note that Channel Master does offer its own line of outdoor and indoor antennas including their CM-3000HD, which has the same thin profile as the DVR+ unit. Next, just turn the unit on and you are set to go - The DVR+ will automatically configure itself to your TV (including matching the output resolution of the DVR+ with the native resolution of your TV). Now, you are set to go. From here you just follow the easy-to-follow onscreen channel guide and other menus to watch and record TV programs. The onscreen channel guide lists over-the-air channels, internet channels, and streaming services. However, only over-the-channels can be recorded. If you have a strong antenna signal feed, an alternate hook-up method is to split your antenna feed (using an RF cable splitter) so that one side goes to the TV's RF input directly and the other goes to the DVR+, and, of course connect the DVR+ to your TV via HDMI for accessing the channel guide, record setup options, and to play back your recordings. By doing this, you will be able to not only record two channels at the same time on the DVR+ (provided you have an external hard drive connected), but you can also watch a third channel while you are recording two other channels. Recording a TV program is really easy. If you want to record the program you are watching currently, just press the record button on the remote. The DVR+ knows how much time there is left in the program and will stop recording when the program ends. This function is great if you start watching a program and get interrupted. On the other hand, if you want to schedule a recording in advance, just go to the onscreen Channel Guide, find your program, click on it and follow the prompt that asks you if you want to record the program. You don't have to go into a menu and figure out the starting and stopping times, although you do have the option, in setting up your recording preferences. Also, if the program is part of a series, you can set the DVR+ to record all programs with the same series title. The DVR+ onscreen menu system is fairly self-explanatory and easy-to-use. By the same token, setting up and playing back recordings is extremely easy. On both the live reception and playback of recorded content, the Channel Master DVR+ provides a good quality image output. Even though the incoming resolution of TV signals may vary by station (all the way from 480i to 1080i for over the air broadcasts), the 1080p upscaling output capability of the DVR+ is very good. For tips on what type of antenna that might be best for you to use to receive over-the-air TV signals, go to AntennaWeb.org, click on the "Click Here to Start Icon", and just follow the prompts from there. Moving on to internet streaming, the main disappointment at the time that this review was first published, is that the only service provided was Vudu - but since that time several services have been added. Thin, stylish, and sturdy build. Connects to the internet via Ethernet or WiFi (via USB adapter). Provides for hard drive storage expansion. Upscales lower resolution input signals up to 1080p. Can record two channels at the same time. Limited streaming content access (Vudu only offered at the time product was reviewed) - recording features only apply to over-the-air TV broadcast - internet streaming content cannot be recorded. Onboard hard drive only has a two-hour storage capacity (HD quality) - external hard drive needed for additional storage which adds to ownership and operation cost. Even though there are two USB ports, only one external hard drive can be connected and used at a time. Due to slim design, there are no onboard controls or LED status display - if you lose the remote, you are out of luck. Remote control commands sometimes have a slight delay. Consumers that receive their TV program content over-the-air have been on the short end of the stick when it comes to DVRs, however, Channel Master has come to the rescue with a stylish and easy-to-use solution - the DVR+ TV Antenna DVR. The DVR+ is easy to setup and use for both TV viewing and recording, as well as allowing storage expansion capability, and the added bonus of being able to stream content from the internet (although the selection is limited so far). Channel Master definitely deserves kudos for providing consumers that want to join in on the cord-cutting trend a practical solution - but it would be even better if the DVR+ offered more than just Vudu on the streaming end of the equation, and that would definitely increase its content access flexibility and eliminate the need for an additional media streamer or TV with Smart features. However, it is important to note that your TV must have an HDMI input - this unit will not work with older analog or pre-HDMI TVs. 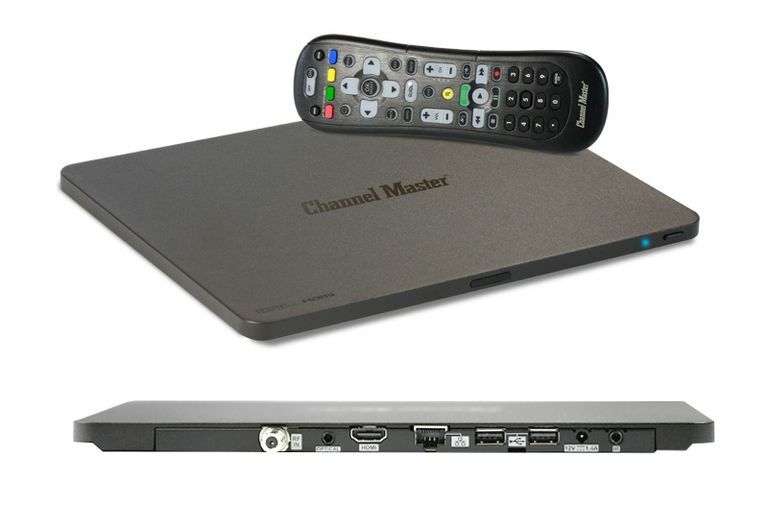 While the standard DVR+ unit review provides up to two hours of recording storage with a built-in 16GB hard drive, and also provides two USB ports that allow almost unlimited storage expansion with compatible external hard drives (1TB and 3TB options available), Channel Master also offers up a Channel Master DVR+ unit that includes a 1TB hard drive already built-in. The 1TB DVR+ eliminates some of the need to add an external hard drive (although you still can) by incorporating an internal 1TB hard drive in place of the smaller 16GB drive installed in the standard version. However, it must be pointed out that, according to my communications with Channel Master, although adding an external hard drive to the 16GB version adds to storage capacity, if you add an external hard drive to the 1TB version, it cancels out the internal 1TB storage. What this means in practicality is that you if you plan to add an external hard drive to the 1TB version, add the 3TB drive as adding another 1TB drive doesn't result in an additional 1TB of storage expansion. Other than the hard drive size and external hard drive function difference, both DVR+ units are identical inside and out.